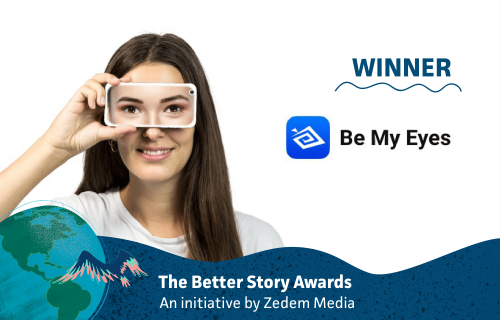 January 20, 2019 /MarketersMedia/ — Be My Eyes is the grand prize winner of The Better Story Awards, an initiative by animation studio Zedem Media aiming to honor organizations that create a positive impact on our society. Be My Eyes app is a free mobile app connecting blind and low-vision individuals with over 1.8 million volunteers through a live video call, helping them in their daily needs. Though the world is full of many stories, those that often dominate, are ones of misfortune. Zedem Media wanted to do their part in changing that by amplifying the voices of organizations that are making a positive impact and share the better stories. Michael Kalopedis, Zedem Media founder said that “The Better Story Awards gave us the chance to meet organizations from around the world. It’s very inspiring to listen to their stories and see how they come up with creative ways to make our society better. Even though we are a small animation studio, supporting local artists and non-profits has always been at the core of our culture. This is our way of giving back to the community with what we do best, films and animations. Denmark based Be My Eyes, will now work with Zedem Media’s creative team in Cyprus to create an animation that will help amplify the organization’s story. "We believe we have a wonderful story to tell and we’re very excited to get the opportunity to work on this story together with a wonderful animation studio like Zedem Media,” said Be My Eyes founder, Hans Jørgen Wiberg. Following up on the public voting, a jury committee comprised of 5 individuals with an extended background in CSR, Marketing and NGOs, reviewed the top up-voted stories and selected the winner. 'Be My Eyes' will receive €10,000 in the form of free animation services. Address: 38 Zenonos Kiteos Street, P.O. Box 41131 Larnaca, 6309 Cyprus.